There was a fire this morning at Regan Lounge in Las Vegas, Nevada that "gutted" the business and caused $500,000 worth of damage. The fire started in the attic and was discovered around 4am, about two hours after the bar had closed. Regan Lounge (formerly Jack's Place) had a makeover from Bar Rescue in February 2017 and the episode just aired on Spike TV in July. Due to the extensive damage, Regan Lounge is now marked as 'Closed' on the Bar Rescue Updates Page. If there are any updates about reopening, I will provide them. 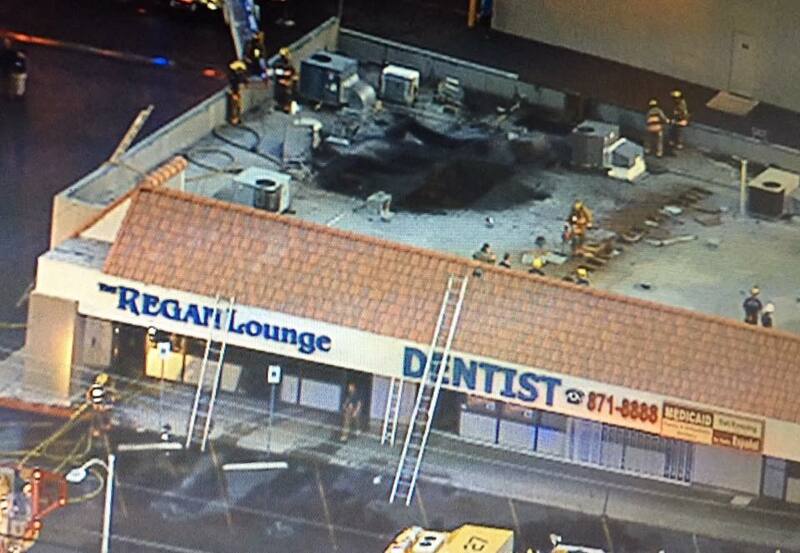 A fire that gutted a lounge in the Bonanza Nellis Shopping Center early Thursday morning is under investigation. One business was gutted, another had moderate damage. A Las Vegas Metro Police officer on patrol noticed smoke coming a large building on the corner of N. Nellis Boulevard and E. Bonanza Road at 3:58 a.m. When firefighters arrived on scene, heavy black smoke was showing from the roof a large commercial building. Most of the fire was found in the attic area of Regan Lounge, 5067 E. Bonanza Road. The fire was burning thru the attic extending to a dental office next door. But firefighters were able to stop it before it did much damage to the dental office. It took firefighters about 30 minutes to bring the fire under control. The fire gutted the lounge and burned a large hole in the roof. The dental office had moderate damage. Total damage for the incident is estimated at $500,000. The cause of the fire is under investigation. The manager of the lounge told fire investigators that she closed the lounge around 2:00 a.m. and did the usually clean up. She said she walked around looking for any problems, but could not find any. She left at approximately 2:30. Firefighters from Las Vegas, North Las Vegas and Clark County fought the blaze. There were no injuries to any responders. The lounge was recently profiled on the TV Show “Bar Rescue” which aired last July. The program centers on a bar/lounge that has a makeover to attract new business. The actual makeover occurred in February, 2017 according to the TV show’s webpage."